@Tiong Bahru | Get Your Grub On! My cwazy friend from Hong Kong was in town and because I never believed her that she could actually show me some decent Okonomiyaki in Singapore and since during all of her prior visits we never managed to come here, she finally dragged me down to ‘Nanjya Monjya‘ by the river. The place was packed and even with our (rather short notice) reservation we only managed to get a seat outside which wasn’t too bad on a beautiful evening like today. The only unfortunate thing was, that outside, the Okonomiyaki were served on plates while inside they cook it just in front of you. The pork one became my numero uno with its’ tasty belly slices, a nice and fluffy mix of dough and cabbage and I totally loved the extra pickles too. The kimchi version was less impressive, also nice but a bit bland and didn’t really get that kimchi punch going that I was hoping for, it was actually more like a vegetarian version of the first one. Both could have used another centimeter in thickness and diameter, but that said, they’re still the giants under the Singaporean okonomiyaki. Before the pancakes, pizzas, omelettes or whatever you want to call them, we also had a round of small dishes for starters. There was some weird dried and then grilled stingray carvings which sounded as interesting as they tasted oddly, way too fishy for me though. Those were followed by a bunch of decent crispy chive gyoza and probably one of the best Miso Nasu (eggplant) I have ever had around here. It was spoon squeezing soft, nearly like caramelised and still wonderful savoury. Pretty wicked. I had to hand it to her, this was a pretty awesome but next time I’ll try to get a seat inside, as even though it’s a scenic atmosphere out by the river, okonomiyaki still belong on a hot sizzling plate. More brunching in Tiong Bahru. 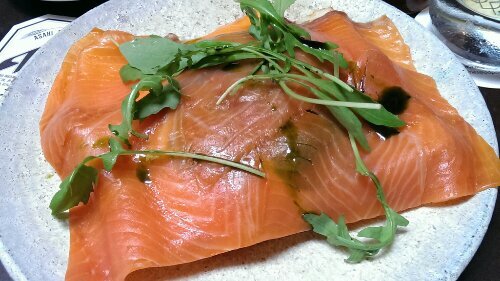 I had been here for a cold drip a couple of weeks ago and wanted to come back and try that delicious looking ‘Smoked Salmon & Scrambled Egg‘. I asked them to make it well done but I think it got mixed up with my friend’s dish as her’s was perfect while my eggs were still quite runny. Nevertheless they tasted pretty good, were creamy and worked very well with the thick layer smoked salmon drizzled with some herbal olive oil. The english muffin could have been a bit more toasted and more arugula would’ve been nice too but all in all a very flavoursome dish to start your day. I liked the place, elegant interior and a nice layout with an open kitchen so you can see your food come together if you’d wish to do so. If they now tune down both the aircon and the prices a little bit I’ll stop by more often to get my brekkie on. Brunch hunting in Tiong Bahru. A friend and I wanted to catch up over brunch and went scouting through Tiong Bahru as we hadn’t been to any of the not so new places that had opened around here some time over the last year or so. Since ‘Tiong Bahru Bakery’, ‘ODP’ and ’40 Hands’ seemed rather packed at the time we just walked around the corner to ‘Flock Café’ that a friend who lived around here had recommended, parked my bag at a free table and ordered their signature ‘Pork Cheek & Gruyère Sandwich‘ and two sunny side up. It looked pretty good and because it was already way after official brunch time I hastily took a huge bite. The bread was apparently ciabatta and even that toasted it was very soft, more like a turkish flatbread and could’ve used a couple of more minutes on the grill. I was starving hungry but would have taken the time but at least it tasted nice. I didn’t think much of the gruyère cheese which unfortunately wasn’t entirely melted but the braised pork cheek they used was really tender and super moist also due to the fat soaking from the cheese, meat and juices into the bread and forming a little grease puddle under it. There was supposed to be mustard but I didn’t taste anything and actually didn’t look for it either. It all tasted good but after I had finished it up I felt rather unpleasant and a bit like a greaseball. It’s actually a nice place, like all these new hip and stylish brunch joints but maybe some more eggs and other breakfast options from the menu would have been a better choice for me today. Now that I have been here already I will most likely check out the other cafes around the area first but might come back to ‘Flock’s’ eventually. I went for a run tonight with some friends around Tiong Bahru. Feeling overwhelmingly confident about our tremendous calorie burn we decided to celebrate this the right way, with pizza. As it happened they live just around the corner of ‘Twoface Pizza & Taproom’, this place which is a coffeeshop over the day and turns into a hip pizza hangout in the afternoon. We ordered the pizzas on our way in, took a shower and they were so kind to give us a call when the first one came out of the oven and also reserved us a breezy table. When we arrived all pizzas came out and we dug in. 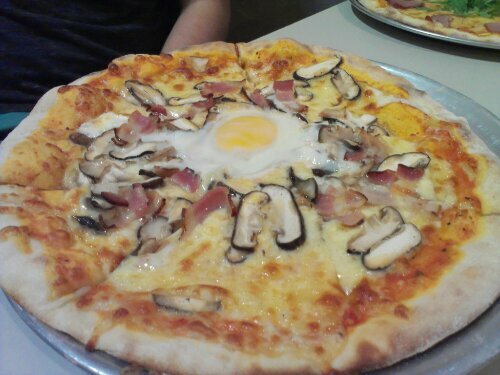 We had four pizzas altogether – please excuse, I don’t have all the correct menu names – the ‘Smoked Duck & Truffle Mayo‘, the ‘Buffalo Mozzarella‘, the ‘Meatlovers‘ and the ‘Bacon Mushroom Egg‘ pizza (this one definitely has a different name). All of the pizzas had a nicely thin dough with a crunch on the edges, the tomato sauce was herby and well seasoned and the cheese gave it all a lovely saltiness. I prefer the tomato-cheese-ratio to be more tomato-y but it tasted delicious anyways. Surprisingly the pizza with the duck was the most blend of the four. The duck was nicely rose and also moist but didn’t taste too special to me. 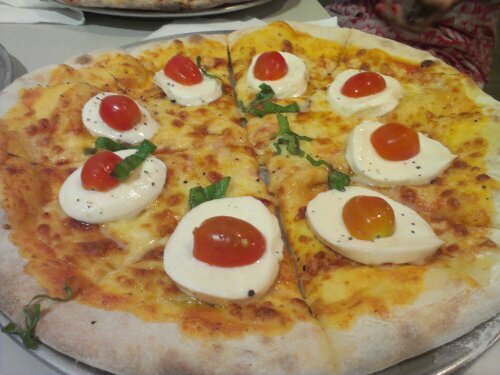 The mozzarella one was like a Margherita but with extra slices of cold buffalo mozza and cherry tomatoes on them. Nice and simple. The change from warm to cold was good as you could really taste the mozzarella and the longer it sat there the cheese started melting. The pie with the bacon and mushrooms had the best looks of them all and the most extravagant taste. Bacon and mushrooms I could wrap my head around but the thought of the egg put me off at first but when I tried it the whole thing worked surprisingly well. The base of the pizza and then the runny yolk on top tasted great together. And at last the meaty version. I would have not ordered it as meatlover pizzas in Singapore are normally way to overloaded with stuff but this one had just a few slices of salami and juicy ham and a brilliant sausage that tasted delicious. Aside the pizzas one thing to mention is their signature ‘Twoface Drink’ a green and super refreshing blend of pineapple, sour plum and cai xin, a local vegetable. Sweet & sour but not too much of either. The concept and vibe of the place, the good food, the nice selection of drinks, the ‘Pork Belly on Fries‘ that I didn’t try yet and not at last the super friendly owners and service make this a great hangout place and I’ll be coming hanging again soon. I try to keep this page lean but will post the other pizza pictures on twitter.